Multani Mal Modi College has won the Inter College Cycling (Road) 20 k.m. 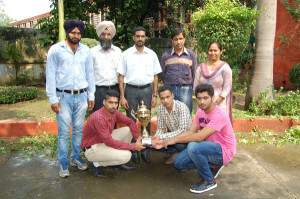 Championship (Men) held at Patiala-Samana Road. The winning team comprises of Rajbir Singh, Mohit Kumar, Prabhdeep Singh and Gagandeep Singh. Public College, Samana got 2nd position in this competition. The college Principal Dr. Khushvinder Kumar and Dr. Gurdeep Singh, Chairman, Sports Committee of the College, congratulated the winning team. The Principal also applauded the sincere efforts of the teachers-in-charge of sports activities, Prof. Nishan Singh and Ms. Mandeep Kaur.